On January 1st, 2011 Florida’s landmark ‘Child Abduction Prevention Act’ (CAPA) was enacted as law. The new legislation establishes an array of risk factors a judge may consider when deciding if there is a chance that one parent may remove a child of a relationship from the state or country or conceal the whereabouts of the child in violation of a parenting plan. Additionally, and critically, the CAPA provides a selection of preventative measures that may be utilized in order to prevent child abduction from occurring. The new law that unquestionably will protect the lives of thousands of children in Florida each year was drafted by child abduction prevention advocate Carolyn Ann Vlk of St. Petersburg, FL. Ms. Vlk added, "In my opinion the biggest obstacle faced was a lack of information and education. My focus was to protect children by enlightening all individuals involved in the process including judges, attorneys, parents and policy makers. Tragically, too many of our nation's children have been abducted due to the failures by individuals and the courts responsible for overseeing their best interest, including assessing dangers that may lead to their possible criminal abduction. The CAPA law addresses this concern." The new law was sponsored by Representative Darryl Rouson (D-St. Petersburg) and Senator Eleanor Sobel (D-Ft. Lauderdale). Under their careful guidance, the groundbreaking legislation did something near impossible: it unanimously passed each of the three Senate and three House committees before being resoundingly passed on both the House and Senate floors. As the number of criminal international parental child abductions continues to escalate substantially each year, lawmakers at both the state and federal level appear to have taken notice. The Department of State’s Office of Children’s Issues reported that there were 1,623 U.S. children criminally abducted from the United States in 2009. The aggregated growth rate over the past few years is well over 20%. These statistics do not include the substantial number of ‘unreported’ cases that were cited in the landmark report titled ‘Crisis In America: International Child Abduction Today’ (2010) researched and published by Peter Thomas Senese and Carolyn Ann Vlk. Peter Thomas Senese, the author of the upcoming book ‘Chasing The Cyclone’ and producer of the educational documentary film series ‘Chasing Parents: Racing Into The Storms Of International Parental Child Abduction’ stated, “The number of criminal international child abductions has reached alarming levels. If we project the present growth rate of ‘reported’ abductions to 2020, an astronomical number of our nation’s children will have been ‘reported’ as being criminally abducted. And this does not include the reality that the number of ‘unreported’ cases of international abduction are expected to be at least the equivalent to the number of ‘reported’ cases. This all should raise a flag for every lawmaker and judge in the country that abduction laws and the consideration of risk factors related to a potential abduction are critical rights of a child. A failure by a court to consider such concerns and not apply appropriate abduction prevention measures to ensure an at-risk child’s safety is child abuse. The CAPA law allows for the presentation of competent and substantial evidence of risk factors. Factors that may be considered when determining if a risk exists include a previous history of child abduction or has been known to violate a court ordered parenting plan, or if there are known threats or clear intent to illegally abduct a child outside of the country, or if the party is likely to take a child to a country that is not a party to the Hague Convention, or if the party has forged or presented misleading or false evidence on government forms or documents in an attempt to obtain travel documents. Preventative measures which may be utilized as a guideline in protecting children from abduction may include placing the child's name in the Children's Passport Issuance Alert Program, a provision that any U.S. or foreign passport issued in the child's name be surrendered to the court or the petitioner's attorney, that the respondent not apply on behalf of the child for a new or replacement passport or Visa, assessing the need to require a party post a bond, a prohibition that a party may not remove or retain the child in violation of a custody determination. This law also indicates that violations of the terms of the parenting plan are subject to specific civil or criminal penalties or a federal or state warrant under federal or state laws and may subject the violating parent to apprehension by law enforcement. Child advocate and lawyer Martin Asatrian commented, "The Florida legislation is a remarkable accomplishment Florida's policymakers achieved in the name of the children of that state. As social and political awareness continues to rise, so too will the outrage of having a child abducted across international borders. It is my hope that not only will the public have a deeper, more compassionate understanding of what both child and targeted parents of abduction must face, but more importantly, it is my hope that lawmakers in other states will demonstrate the courage and wisdom similar to what Representative Rouson and Senator Sobel demonstrated. Clearly, prevention is key to protecting our nation's children." In closing, Carolyn Ann Vlk stated, "Parental child abduction cases can become very costly especially if search and rescue efforts become necessary. I anticipate that there will be less need for law enforcement involvement if risks are identified and preventative measures are implemented. The State of Florida now has additional capabilities to protect children from becoming victimized and to conserve our state's financial resources. However, the problems of international parental child abduction that need to be addressed as a nation are significant. I look forward to participating in dialogue and action that will better protect our nation's children, including co-drafting new legislation that will close loopholes related to travel documentation requirements for children traveling under the Western Hemisphere Travel Initiative." If you believe your child is at risk, it is critical that you prepare your child on what to do if they are taken (Click here to view how to prepare your child). If you are interested in understanding the terrifying aspects and difficulties associated with international parental child abduction, I invite you to read 'Chasing The Cyclone' (Click here to read the reviews). 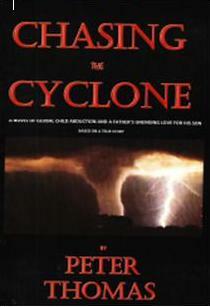 To read Chapter 1 of 'Chasing The Cyclone' please Click Here. For more information on the growig epidemic of international parental child abduction, please Click Here. For more information on best-selling author Peter Thomas Senese, please Click Here. or to read more about Peter Thomas Senese's books, please Click Here. For more information on child abduction and child slavery risks associated with the Western Hemisphere Travel Initiative, please Click Here. To read more essays and articles on international parental child abduction, please Click Here.